Welcome back to Thunder Point, a town in Oregon where the people look out for each other, and newcomers are welcome to make a fresh start. 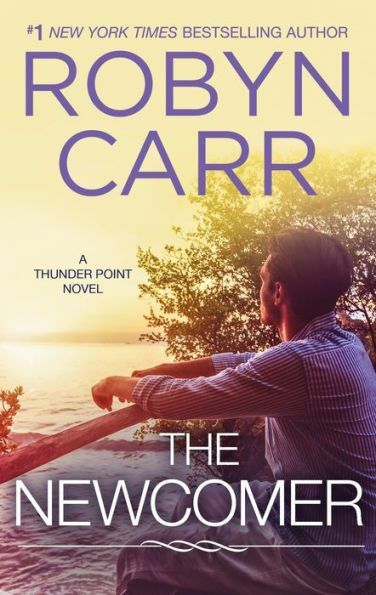 Book two in the bestselling series from Robyn Carr. Single dad and Thunder Point’s deputy sheriff “Mac” McCain has worked hard to keep his town safe and his daughter happy. Now he’s found his own happines with Gina James. The longtime friends have always shared the challenges and rewards of raising their adolescent daughters. With an unexpected romance growing between them, they’re feeling like teenagers themselves—suddenly they can’t get enough of one another. And just when things are really taking off, their lives are suddenly thrown into chaos. When Mac’s ex-wife shows up in town, drama takes on a whole new meaning. Mac and Gina know they’re meant to be together, but can their newfound love withstand the pressure? Originally published June 2013 in mass market paperback and eBook. Chapter OneIt was a warm, sunny afternoon in early April, a rarity on the coast for this time of year. Spring meant rain, which resulted in wildflowers—the best in the country. Cooper sat out on the deck of Ben & Cooper’s in his white T-shirt and jeans, his feet propped up on the deck rail. Hamlet, a harlequin Great Dane, sat beside him, watching the sea, his ears perking sometimes when a person, a boat or bird caught his eye. Cooper was enjoying a heavily creamed coffee and watching Sarah Dupre out on the bay, paddle boarding. She wore a wet suit that he’d given her for Christmas—short sleeves, knee length. The water hadn’t warmed up; it was icy cold. The Pacific was always cold, except maybe down San Diego way. But Sarah was an expert; she barely got her feet wet. The way that wetsuit hugged her body—it was like art. She had incredibly strong legs, a perfect round tush, breasts about the size of his palms. She’d been born in a coastal town and was probably as comfortable on the water as she was on the land or in the sky—diver, swimmer, surfer, helicopter pilot. Ham was in his charge, and he’d been watching Sarah for an hour; she’d gone all the way out to the mouth of the bay and back. She was finally coming in, just ahead of the fishing boats headed home to the marina. This life was the furthest thing Cooper had ever envisioned for himself. He had come to Thunder Point last October to look into the death of a good friend, Ben. To his surprise he had inherited what was Ben’s falling down bait shop with a bar. For lack of a better idea, he renovated, turning it into a first class beach bar, and had found himself a new home. He also found a woman, another surprise—he hadn’t been looking. After all the women in his life, short or long term, it was as if Sarah was everything he’d been waiting for. He had officially opened the beach bar—no more bait—in late February. Now, as the proprietor, there was plenty of time to visit with folks from town, let the gentle lapping of the bay soothe him, watch his woman on her board, gently gliding across the calm water between the huge off shore boulders in the bay. He had a farmer’s tan, stronger shoulders from lifting and hauling bar supplies and a lot of new friends when he’d always considered himself a solitary kind of guy. Sarah leaned her board and paddle against the dock and came up the stairs. When she reached the deck, he tossed a towel at her, and she dried her feet. Hamlet stood to his horse height and wagged. “There isn’t room for another dog around here. Come here,” he said, pulling her onto his lap. She went to him, sat down, picked up his coffee and helped herself to a sip. “How many times a day to you talk to Landon?” he asked. It was just Sarah and sixteen-year-old Landon; they were a family of two and kept pretty tight tabs on each other. And with Sarah being a Coast Guard Search and Rescue pilot who worked out of the North Bend station, sometimes it wasn’t easy. “Do you have anything green?” she asked. Cooper ran the bar menu on deli items purchased from Carrie’s deli in town—simple things from pizzas to sandwiches as well as some desserts—things that could be served cold or warmed. This was not a restaurant. Cooper bought himself a grill for his own use, but didn’t use it to serve patrons. Cooper had also inherited a helper, Rawley Goode, a Vietnam Vet who was not overly friendly and while he might be a good cook, he wasn’t pleasant enough. And he was needed for other things—maintenance, cleaning, purchasing and delivery from big box stores like Costco that were out of town. Therefore, personal groceries were often in short supply. “I bet you have something green,” he suggested. “I live on green things,” she said. ~~~~~~Sarah was home in bed before eleven. Not only did she have an early start the next day, but she didn’t stay the night with Cooper because of her sixteen-year-old brother, Landon. Although Landon wouldn’t be either shocked or disapproving—he had found Cooper first, and they were pals. In fact, if Sarah wasn’t mistaken, Landon would consider it a personal favor if Sarah and Cooper somehow made a lasting commitment. That might be closer to a reality but for complications, not the least of which was Sarah’s brief, disastrous marriage not terribly far in the past. She was not only understandably gun shy, she also had Landon, just finishing up his junior year in high school and headed for a fantastic senior year—his athletic prowess and academic performance would undoubtedly land him a scholarship. And they needed that scholarship. Sarah did all right, but sending someone to college for four years would prove a challenge. Sarah was finished in the bathroom and on her way out the door before Landon stirred for school. She left him a note and twenty dollars for gas or lunch or incidentals. She certainly didn’t mind driving to work while feeling so fit and fresh after a day off on the bay, a good dinner with Cooper, a couple of hours of recreation under the sheets—something Cooper had a particular talent for. It added up to making her feel brand new and full of energy. The station was getting ready for a big inspection in the next couple of weeks, and there was plenty to do, from preparing for check rides to auditing maintenance records. They’d have to show the command they were one of the best air stations in the Coast Guard, and they’d have to get ready while performing business as usual. Given that Sarah, Lieutenant Commander Dupre, was second in command of the flying operation at the station, her role in this prep would not be small. It was no surprise that when she turned on her computer there was a note from her immediate boss, Buzz Bachman, asking her to come to his office ASAP. She was sure, if she knew the man at all, he had a long list of things for her to do. She made herself a cup of coffee on the way, stirring in some cream and sweetener. “Morning, boss,” she said, entering the small office. “We’ll be ready,” she said, sipping her coffee. “And I’m not due for either,” she said, sliding forward on her chair a little bit. “Resign my commission? I have no idea what I’d do outside of the Coast Guard,” she muttered, looking into her coffee cup. “And I know that feeling, too,” he said. She looked up and connected eyes with him. She gave a half smile—small wonder he’d been married twice, he was a good looking man. Blond, expressive brown eyebrows, strong, smart, and a set of choppers that would put Donny Osmond to shame. All this had earned him the nickname Buzz Lightyear. “Why do you have a mole in HR?” she asked. Sarah smiled in spite of herself. “Not in a bad way,” she said. “Two of them?” she asked cynically. “There are people who would kill for a chance like you have,” he said. ~~~~~~~Sarah wasn’t one to panic, unless her career was about to turn everyone she loved upside down once again. She could tell Landon, give him time to adjust to the possibility and come up with his own coping options, but she wouldn’t. She wasn’t most afraid he’d balk and sulk, she was afraid he’d say, “Whatever, Sarah. Just let me know.” He was that kind of kid, that kind of brother. He wasn’t a typical sixteen-year-old boy, probably because of how challenging his life had been. She often worried about how much disappointment he was holding inside to spare her. Landon was only five when their parents were killed in an accident, spent one horrifying year with their mean, spinster aunt and then had spent the last ten years as her responsibility. She’d moved him five times, put him through a divorce from a man he’d grown attached to and now, just when he was happiest … No, she couldn’t do it yet, not until she had time to think it through. She could tell Cooper. He loved her; he was proud of her. But he’d just put all his energy into setting up his local business, and she couldn’t give him the options of breaking it off with her now or leaving behind all that he’d acquired to follow her. She could tell that his new lifestyle not only suited him, he was very happy. Relaxed. “If Eve comes over for homework tonight, will it bother you?” he asked. “Nope. I’ll take my paperwork to my bedroom. What are you cooking?” she asked. “Damn,” he said, making her laugh. But I have to work on my poker face. 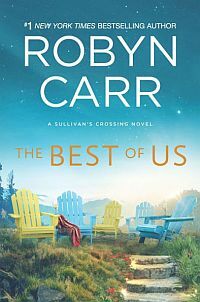 Robyn is giving away a signed hardcover edition of THE BEST OF US.